One of the biggest challenges we face in Early Intervention is teaching our children social skills. Many of our children struggle with taking turns, sharing, using nice words, and simply engaging in simple back and forth conversation. The National Association for the Education of Young Children published an article in “Beyond the Journal” in November 2006 titled “You Got it! Teaching Social and Emotional Skills.” The article was written by Lisa Fox and Rochelle Harper Lentini (read it here) and it discussed the importance of teaching social and emotional skills and ways to go about doing so. Fox and Harper (2006) suggest that teaching social skills involves three stages of learning: introducing a new skill (show-and-tell), building fluency (practice makes perfect), and skill maintenance and generalization (you got it!). 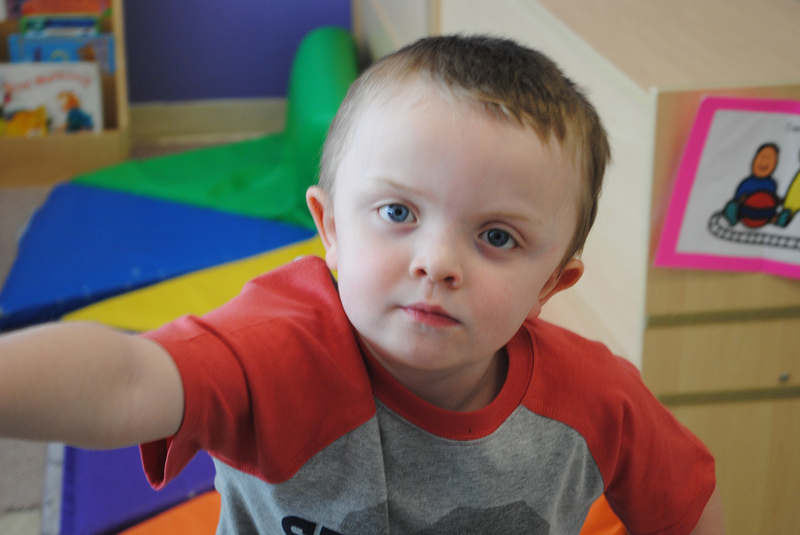 Our philosophy here at Easter Seals is first establishing positive relationships in which we foster a safe and happy environment to prevent challenging behaviors. 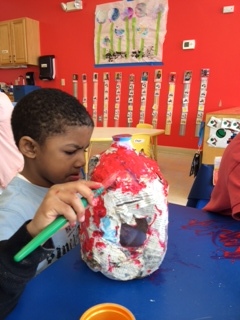 Easter Seals Early Intervention Center in Philadelphia recognized a need to get creative with the way we teach social skills and the way we “show-and-tell” new skills. Simply telling a child to “be kind to your friends” means nothing to them unless we show them what “being kind” looks like. Many of our kids need to be highly motivated to stay on task and maintain attention to grasp new concepts. Together staff brainstormed and we came up with the idea to put on a puppet show to help teach kindness: helping your friends and teachers, and sharing. Staff members jumped at the opportunity to volunteer to be a character in our show. One of the strategies that Fox and Harper (2006) list in the article talked about modeling with puppets, so we knew we had chosen a winning strategy! We chose the story “The Little Red Hen (makes a pizza)” by Philomen Sturges and adapted it slightly to make it more relevant for our children. Similar to the original Little Red Hen Story, the farm animals refuse to help the Little Red Hen as she makes her pizza, but as the story continues, the pig, the duck, the dog, and the cat realize in the end the importance of helping a friend and sharing. We invited the families to attend and all together shared our own pizza party after the puppet show performance. 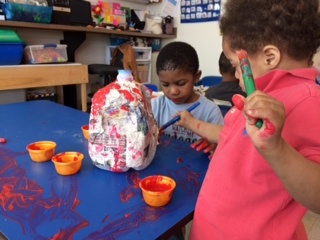 Back in the classrooms, the teachers continue to use puppets and repeat the same lesson they learned in the story of “The Little Red Hen (makes a pizza)” in order to build fluency and generalization. The clip you can watch below is a snapshot of our puppet show where in the end together the animals washed the dishes. We are ecstatic with that way the children responded to the puppet show and we plan on doing it again in the Fall! Laura Corbett has been working with Easter Seals as a Special Education teacher since January 2013. She works in the Philadelphia division both in the classroom, the community, and as a Supervisor. She received her Bachelors in Early Childhood and Special Education from the University of Delaware and is a few classes away from her Masters of Education from Arcadia University. She has been working in Early Childhood/Special Education since June 2009. Some of her previous work experience includes teaching young children of abuse and neglect (often with developmental delays) along with their parents in Southwest Philadelphia and an inner city writing program for kids from 5-18 years of age in South Philadelphia. She is very passionate about behavior management/social skills, the use of a therapy dog with kids with special needs, and really enjoys working with the families and establishing strong & support relationships. Laura loves her dog, going for a run, and enjoying the beach with her family and friends in the summer at the Jersey Shore. 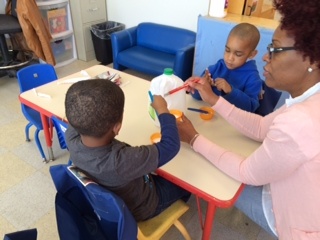 This entry was posted in From the teacher, Tips from therapists and tagged "The Little Red Hen (makes a pizza)", Early Intervention, Easter Seals, NAEYC, Philomen Sturges, social skills on May 27, 2014 by Easterseals. There are so many amazing children we have the opportunity to serve! And when the kids are amazing, you can bet their families are too! Walk With Me is a great opportunity to meet some amazing children and their families and we are so thrilled Paige is one our honorary ambassadors this year. Paige is one of the most fashionable five-year-olds you will ever meet! Her stylist (mom) keeps her looking good…but Paige always brings the most important accessory that truly brings the look together…her smile! Paige’s smile and sparkling eyes make every look amazing. Paige has cerebral palsy, seizure disorder, chronic lung disease and global developmental delays, which have resulted in countless surgeries and hospitalizations, but she is rarely without that smile. 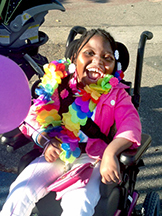 When it came time for her to attend school, her parents chose Easter Seals. They loved the staff and are now truly enjoying the new building, Paige loves going down the long bright hallway and looking through the windows. With the help of teachers and therapists, she has become more attentive and has increased her communication skills, perfect for a little girl who just loves to be around people! When you meet her, you will find it impossible not to fall in love with her. Her love of life, which includes theater, music, reading and even skating touches everyone around her! This entry was posted in child stories and tagged cerebral palsy, chronic lung disease, communication skills, Easter Seals, Easter Seals of Southeastern Pennsylvania, global developmental delays, seizure disorder, Walk With Me on May 22, 2014 by Easterseals. Interpersonal skills: are the ability to perform competently in social situations which is important for peer acceptance and social adjustment. Learning related skills: are the ability to self-regulate and act competently in social classroom tasks and learning situations. In general, children’s interpersonal skills have been linked to social outcomes whereas learning-related skills have predicted academic success. Enters a conversation, takes 2 turns on the same topic, changes the topic, and leaves the conversation. Chicka Chika Boom Boom by Bill Marin Jr.
¨ Variety of social skills can be addressed during these games depending on where the child is developmentally. Requesting a desired item from an adult and/or peer. ¨ Board games are also a great way to help expand your child’s language (i.e. : requesting for a specific color game piece) and work on different concepts (i.e. : colors and shapes). Playing with a ball is great for working on…. Requesting for turn with the ball. Touching a picture to request turns on swing, etc. for nonverbal communicators. Elizabeth Haftl has been a speech therapist for 1 year, working in a variety of pediatric settings in Delaware, Maryland, and Pennsylvania during her graduate school practicums and as a clinical fellow. She graduated from Towson University in Maryland in May of 2013. She has been with Easter Seals in the Delaware County Division working with children in the Reverse Mainstream, Autistic Support, Multiple Disabilities, and Developmental Delay classrooms. Her favorite aspect of her current job is the ability to create positive changes in the lives of the children she is working with. Beth loves to kick box and enjoys going to amusement parks. Walk With Me is our biggest event, yet our Honorary Ambassadors and their families, and everyone who comes out to support them, make it the most personal. Walk With Me is an amazing day at the Philadelphia Zoo that has impact that lasts all year long. One of our ambassadors this year is Reggie. 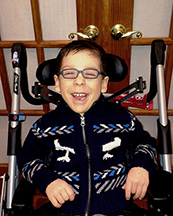 He is a shining example of how when you combine the expertise and passion and Easter Seals staff and an amazing family, a child can really shine! Reggie has a laugh so great that just hearing it will make you smile. 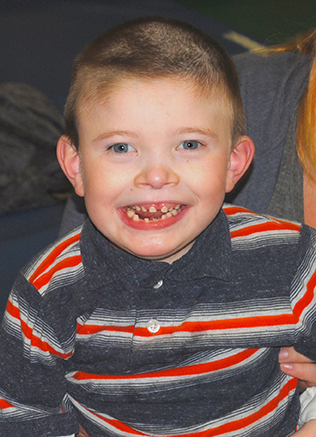 And lucky for us, this sweet five-year-old loves to laugh! So much so, that he will actually put your hands in his favorite tickle spots. Reggie has autism, which can make communication a challenge, but when it comes to what he wants, he knows how to make it happen. Reggie has been attending Easter Seals autistic support class since he was three. Since then he has become much more social, learned to dress himself and has gone from the boy who avoided touching things to just plain unstoppable! When he isn’t wowing teachers and therapists at Easter Seals with his progress and ever-happy personality you can find him doing some of his favorite things. He loves visiting as many parks with his mom as possible and taking a spin on his awesome big wheel with his dad. Reggie loves to be outside! But when he is home, there is nothing better than pizza and singing and dancing along with Mickey! This entry was posted in child stories and tagged autism, Early Intervention, Easter Seals, Easter Seals of Southeastern Pennsylvania, https://easterealssepa.files.wordpress.com/2014/05/reggie-2.jpg?w=650, Philadelphia Zoo, Walk With Me, zoo on May 7, 2014 by Easterseals.